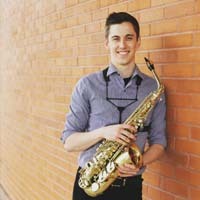 Bio: Derek Granger is an Associate Instructor of Saxophone at the Indiana University Jacobs School of Music, where he is pursuing his MM in Saxophone Performance in the studio of Otis Murphy. A native of Las Vegas, Nevada, Derek graduated from the University of Arizona in 2011 with degrees in Music Education and Saxophone Performance. Derek served as the Director of Choirs at Flowing Wells High School in Tucson, Arizona from 2011 until 2017, during which time he also played alto saxophone with the Presidio Saxophone Quartet and freelanced throughout the Tucson area. Former teachers include Timothy McAllister, Kelland Thomas, and Mark McArthur.